Don’t choose a half-baked, outdated prep course and take chances with your career. 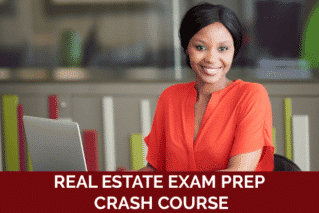 If you’re an aspiring California real estate broker or salesperson… you need the BEST prep course. Make the smart move with the most updated and most interactive crash course for serious professionals. 1-Day Live Class Instruction. Hey there, aspiring real estate professional. If you’re reading this… chances are you’re already taking your mandatory pre-licensing course. You’ve committed to becoming a real estate broker or salesperson. Kudos to you! You’ve taken the first step towards a promising, fulfilling career. But, THAT is ONLY the first step. You have a full-blown journey ahead of you. A journey that involves taking the California State Exam and passing it with 70% if you’re a salesperson and 75% if you’re a broker. You can’t afford to stumble and choke before the finishing line. Failure is NOT an option for you. This is your career we’re talking about. A career that not only brings a great deal of prestige and respect but also makes serious money.